Workers remove cedar shingles, coated with lead-based paint from a camp in Northport, Oct. 3, 2017. Despite a recent push to identify kids with lead poisoning, hundreds of Maine children are likely still exposed to its harmful effects because of the state’s low, inconsistent rates of screening toddlers during their annual doctor’s checkup, according to a new report. The effects of lead poisoning, which causes a range of health problems, including developmental delays in kids, don’t appear until years after a child has been exposed. That means it’s imperative that parents and doctors catch the problem early. In states with older housing stock where lead paint is prevalent, like Maine, the U.S. Centers for Disease Control and Prevention recommend that 1- and 2-year-olds get their blood tested for lead during their annual doctor’s visit. Wednesday’s report draws from information compiled from state and national databases and interviews with New England public health officials. 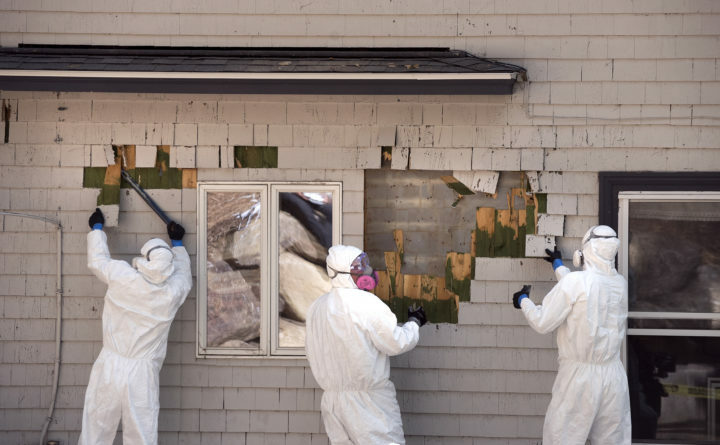 It aims to single out Maine’s low testing levels, but also underscores how the state’s regulations lag other states with old homes where lead paint is commonly found. It follows similar findings on lead poisoning prevention published in January by the Maine Center for Disease Control and Prevention. Children covered by MaineCare, the state’s Medicaid program, were not immune from the trend despite a federal law that requires enrolled children to be tested at ages 1 and 2. Maine’s rates, however, hover around 52 percent and 37 percent, respectively, for 1- and 2-year-olds. Wednesday’s report suggests that not all Maine kids are benefiting from a tougher childhood lead poisoning prevention law passed in 2015, which lowered the state’s standard for lead poisoning from 15 micrograms per deciliter of blood to match the federal standard, which is 5 micrograms per deciliter. The change prompted the state to identify more exposed kids, triggering a sevenfold increase in the number of residential buildings inspected for lead contamination, which is required if a child who lives there is flagged with elevated blood levels, according to the Maine CDC. Kids who have been exposed to lead don’t usually show symptoms until the contamination has built up to dangerous levels, usually over the course of years. In addition to physical side effects, poisoning can cause learning and developmental disabilities. The 2015 law brought Maine closer to its unmet goal of eliminating childhood lead poisoning, which a 1991 law aimed to have the state achieve by 2010. Still, between 2013 and 2017, nearly 1,800 children were identified with elevated lead levels in their blood. But likely hundreds more have gone undetected because they haven’t been tested, according to Wednesday’s study, titled “Comparative Assessment of Lead Poisoning Screening Practices in Maine & New England” and prepared by the firm Health Justice Innovations. Among the top eight states with the oldest homes, Maine and Pennsylvania are the only two that haven’t passed a universal testing law, the report states. (The Pine Tree state has the sixth-oldest housing stock in the country.) When Connecticut implemented its law in 2009, the researchers said, it spurred the outreach among doctors that resulted in boosted screening levels. Maine is also out of sync with federal guidelines that recommend mandatory blood testing for children in states where more than 27 percent of housing was built before 1950. Nearly 56 percent of children here are born in counties that fall above that threshold, the report states. Last year, New Hampshire passed a universal testing law, making Maine the only New England state without one.